The QC lab is often seen as outside of the pharmaceutical production process, and, as a result, opportunities for improved efficiency and operational excellence are missed. 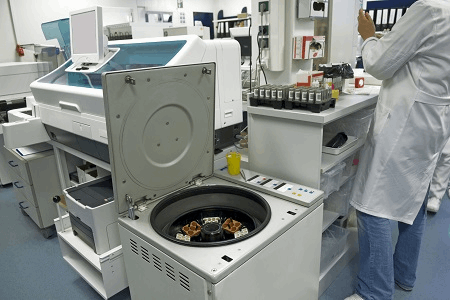 A major source of complexity and poor utilization of resources is often lab throughput time — the time between the arrival of a test sample in the lab, completion of testing, and release of the data. The “lean” principle, originally designed to improve and streamline manufacturing operations, can also be used to transform a QC lab and significantly improve laboratory throughput time, improve productivity, and create a “right first time” (RFT) environment with more predictable performance. When this lean approach is combined with operational excellence principles, extraordinary results follow. A case study involving a pharmaceutical company with many products showed significant complexity in scheduling, queueing, coordinating, and conducting tests. Through implementation of lean principles, the company reduced its 15-day throughput time by 30 percent within three months. The organization transformed its manufacturing supply chain and improved both upstream and downstream. To realize the full potential of cost savings, RFT results had to be increased. To achieve this, utilization of personnel was increased through elimination of redundant and non-value-added work, rather than simply speeding up an already complex operation or pushing more money at the problem. The primary challenge in implementing lean QC lab operations is overcoming perception. Lean is well-understood in manufacturing circles, but less so in laboratory operations, and few case studies exist to show how manual scheduling can be eliminated in favor of a “pull” sample flow. Due to the technical complexity of testing, the QC lab is not seen as part of the production process, and therefore not subject to the same expectations. Organizations that acknowledge the complexity of the analysis, but still recognize the lab as part of the overall product conversion operation, have a distinct advantage. Sample scheduling is often overlooked as an area of potential improvement, since it is seen as not adding value. It is not unusual to have multiple scheduling tools in use, some of which are ad hoc workarounds and simple spreadsheets that do not measure up to volatile demand patterns and the need for frequent expediting. In the pharmaceutical case study, unconnected scheduling tools resulted in waste and a lack of visibility, and scheduling accounted for more than 13 percent of the entire lab operation time. In this case, there was a lack of understanding of the interdependency that exists, and that lack of understanding created waste throughout the entire manufacturing cycle. Specifically, the operations planning department did not appreciate constraints in laboratory capacity, and, as a result, there were significant peaks and valleys in scheduling. Those peaks and valleys resulted in inefficient use of personnel and equipment. Lastly, pharmaceutical organizations face a major challenge in understanding the difference between streamlining and actually eliminating waste. Simply streamlining a manual sample scheduling process still results in a manual process and all the problems inherent with it. A better approach eliminates the manual process entirely in favor of visual cues and a “pull” system. For this pull sample management system to be effective, a firm foundation in lean processing is required to improve throughput speed, capacity, and predictability. Organizations that eliminate manual scheduling find the pull approach contributes to lean building blocks, each interacting and boosting overall performance. The approach requires coordination of all operations functional groups and establishing mechanisms that balance workload against capacity and reduce bottlenecks. That balance requires capacity to always be available to meet peak demand — again not by adding personnel, but through waste reduction. This will help smooth out those peaks, reduce cycle time variability, and eliminate sample demand volatility. Ultimately, this requires understanding what affects productivity and capacity, both internally and externally. implementing visual cues to manage sample flow, build a lean foundation, visualize the current state, and identify opportunities. Identify how the lab creates value. Map out the entire value stream, including inputs and outputs. Target waste reduction that affects throughput variability and speed. Level the lab’s load and sample mix. Create a pull system to move samples through the lab more quickly. The process began by analyzing the workload from the previous year, in which the team saw significant variation in volume and sample type. They then assessed capacity and their ability to manage peaks and valleys, with the understanding that increased capacity would have to come through improvements in productivity, speed, and predictability. By executing projects that resulted in a higher rate of RFT results and implementing a lean lab approach, significant improvements in productivity were realized, delivering a 22 percent reduction in overall conversion cost, reducing testing turnaround time by more than 50 percent, and simultaneously increasing analyst productivity by more than 25 percent. RFT went from 95 percent to more than 99 percent, without any corresponding increases in equipment or personnel costs. Looking at the lab processes with a lean approach helped create an entirely new perspective and a new way of thinking, allowing the lab to transcend older entrenched processes, visualize the current state, identify opportunities, and take corrective action. 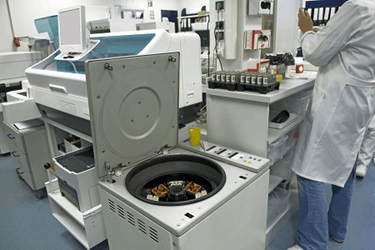 Specifically, one of the opportunities that became evident as the lean initiative progressed was cell-based workspaces for high-volume samples. The results were improved productivity and throughput time, as well as a major improvement in RFT goals and predictability. Other simple but efficient fixes included consolidating reagent preparation, reorganizing placement of supplies, and kitting to reduce wasted motion. Throughput time for the solids group went from 15 days to eight days, far exceeding their 30 percent goal, and throughput time is expected to drop to six days within a year. Greater cross-training contributed to better utilization of personnel, and lab investigations decreased as a result of a corresponding increase in RFT results. The lean lab initiative allowed the group to better understand and manage the interdependence among functional groups. There was a cultural transformation as well, and the company gained a significant ongoing competitive advantage and is better positioned to react to constantly changing market demands and new product introductions. Scott Myers, senior managing consultant at Tunnell Consulting, has more than 25 years of experience in technical, managerial, and business leadership in the global pharmaceutical industry. He is adept at identifying and controlling risks associated with development and commercialization of pharmaceuticals. Myers is known for his expertise in the interpretation and execution of domestic and international cGMP requirements. Prior to joining Tunnell, he was executive director, compliance and quality oversight at Boehringer Ingelheim (Bedford). Myers was responsible for setting the company’s strategy for the interpretation, auditing, and execution of those requirements. He led the compliance and environmental, health and safety (EHS) teams. You can reach him at scott.myers@tunnellconsulting.com. Greg Anthos, senior managing consultant, brings to Tunnell over 30 years of experience in the life sciences industry. He is adept at strategy development and execution, change management, operations management, and program/project management. He is a seasoned operations leader with significant experience in engineering, organizational transformation, and supply chain. Prior to joining Tunnell, he spent 30 years at Merck & Co., most recently as executive director, business consulting, where he was a program leader in charge of transforming a 2,000-person global regulatory affairs function. He is a Lean Six Sigma Master Black Belt as well as Change Agent II and Process Improvement Master. You can reach him at greg.anthos@tunnellconsulting.com.